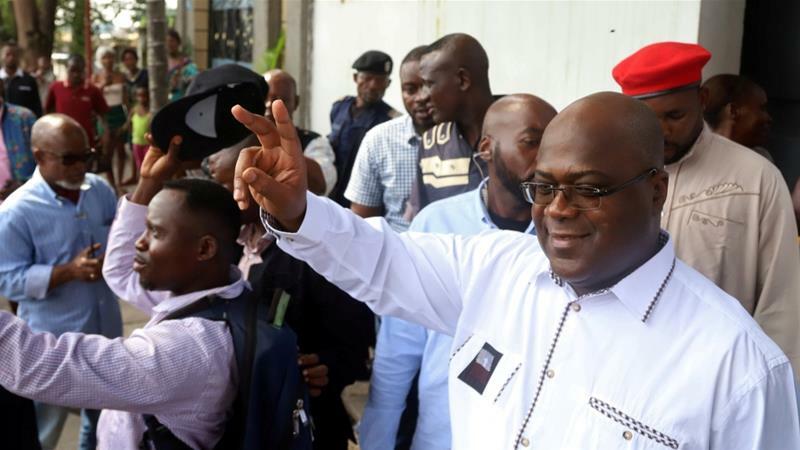 In the early hours of Jan. 10, election authorities in the Democratic Republic of Congo finally announced that Felix Tshisekedi, leader of the opposition Union for Democracy and Social Progress, won the election held on Dec. 30 with 38.57 percent of the vote. If Tshisekedi’s victory is confirmed — predictably, the results are being contested — an opposition politician will assume power after 18 years of rule by President Joseph Kabila. But it does not follow that peace and prosperity will automatically ensue. Tshisekedi has a long road ahead of him. Central Africa’s giant holds the continent’s richest mineral wealth, yet, having suffered war and violence for most of its history, its economy remains woefully underdeveloped and its people impoverished. Kabila assumed power in January 2001 after his father, Laurent, was assassinated. Over Joseph Kabila’s 18-year rule, the DRC has remained fragile, owing to persistent, protracted conflict in the country’s eastern regions and elsewhere, as well as rampant corruption and looting of state assets. Little has changed for ordinary Congolese, 80 percent of whom live on less than $1.25 a day. Apart from the enduring challenges of poverty, neglect, war and corruption, which have characterized domestic politics in the DRC, Tshisekedi has some serious and immediate hurdles to overcome if he is to be inaugurated. First, Tshisekedi will have to contend with accusations surrounding the legitimacy of the election, which was peppered with irregularities. According to the 40,000 observers organized by the Catholic Church, late poll openings, problems with ballots and reports of intimidation resulted in many being unable to vote, with turnout reaching just 47.56 percent. These issues, coupled with earlier concerns about the reliability of voting rolls, cast a shadow over the election’s overall integrity. Furthermore, two political heavyweights who were barred from participating in the election, Jean-Pierre Bemba and Moise Katumbi, back Tshisekedi’s closest opponent, Martin Fayulu, who won 34.83 percent of the vote. Western media widely reported on Fayulu’s popularity and his likelihood of winning, and he is contesting the election’s legitimacy, charging that Tshisekedi made a backroom deal with Kabila. The French government has expressed its support for Fayulu as the election’s real winner, and election officials’ delay in announcing the results for a few days lends further credence to the perception that the result was rigged. There is now a large near-term risk of violence by Fayulu’s supporters. Without an outright victory, it is vital for Tshisekedi to solicit the support and collaboration of the broader opposition in order to bolster his position and minimize the risk of unrest. Fortunately, such an approach could work, given that the forces behind Tshisekedi and Fayulu managed to coalesce at various points during the two years that Kabila had been postponing the election. With the eastern DRC experiencing ongoing violence involving Rwandan, Burundian and Ugandan forces, as well as rebel forces opposing those countries’ regimes, the cooperation of Presidents Paul Kagame of Rwanda, Pierre Nkurunziza of Burundi and Yoweri Museveni of Uganda remains crucial. This has not changed, and nor has the militarization that characterizes Congolese politics. Tshisekedi must secure the acceptance of the generals, which may require some tricky trade-offs, given that he vowed during the campaign to root out corruption. Negotiating an exit strategy for Kabila and his many cronies (including possible immunity from prosecution) will be an important component of this process. Tshisekedi will also have to reach out to the region’s leaders in order to secure the political transition. With the eastern DRC experiencing ongoing violence involving Rwandan, Burundian and Ugandan forces, as well as rebel forces opposing those countries’ regimes, the cooperation of Presidents Paul Kagame of Rwanda, Pierre Nkurunziza of Burundi and Yoweri Museveni of Uganda remains crucial. To obtain it, Tshisekedi will have to demonstrate quickly that he has their interests at heart, as well as the sheer stamina to keep abreast of the challenges that emerge in the Great Lakes region. South Africa and Angola, too, enjoy close relations with the DRC and their acceptance of the presidential vote will be vital to ensuring regional stability. The former’s tenure in the UN Security Council, which began this month, is likely to increase its importance as a potential ally. South African Foreign Minister Lindiwe Sisulu has not so far backed Tshisekedi, instead supporting a call from regional body the Southern African Development Community for a unity government to achieve a transition of power. Tshisekedi’s apparent victory, and the promise of a new government, should be a cause for celebration, at home and throughout the Congolese diaspora. But the transition now facing the DRC is certain to be long, perilous and frustrating. The celebrations may prove short-lived if no workable reconciliation among the country’s opposing forces is achieved in the coming days and weeks.